BOSTON - Nearly 36,000 runners set out from the Boston Marathon starting line with security tight along the 26.2-mile course Monday, in a show of resilience a year after the bombing that turned the race into a scene of carnage. To the delight of many in the crowd, an American won the men's division for the first time in more than three decades, dominating a field that included many athletes who were prevented from finishing last year. Eritrean-American Meb Keflezighi, a former New York City Marathon champion and Olympic medalist, won the men's title in 2 hours, 8 minutes, 37 seconds. He held off Wilson Chebet of Kenya, who finished 11 seconds behind. Cheers rose up as word of the first American man to win in Boston since 1983 spread through the pack of runners. Keflezighi had the names of last year's victims written in black marker on the corners of his race bib. He finished minutes before women's champion Rita Jeptoo of Kenya successfully defended her title in a course record. Keflezighi looked over his shoulder several times over the final mile. After realizing he wouldn't be caught, he raised his sunglasses, began pumping his right fist and made the sign of the cross. 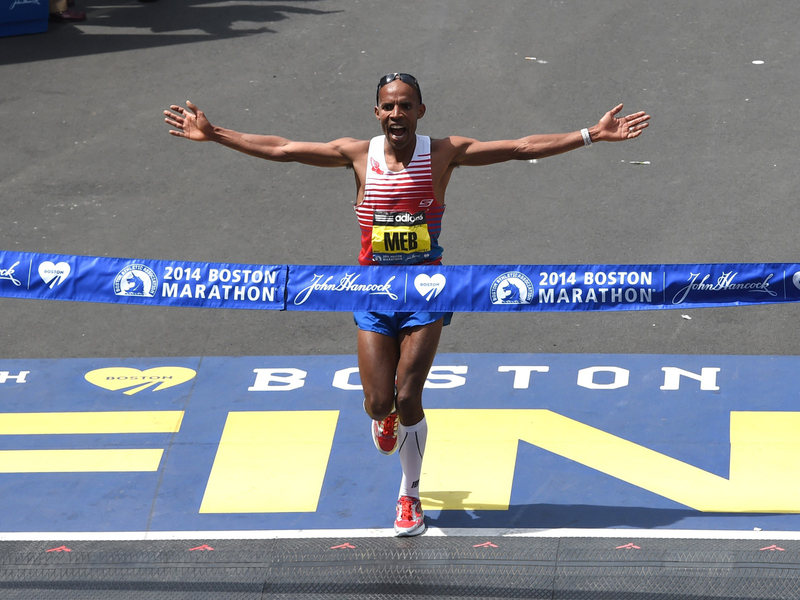 "I'm blessed to be an American and God bless America and God bless Boston for this special day," Keflezighi said. He's the first U.S. winner since Lisa Larsen-Weidenbach took the women's title in 1985; the last American man to win was Greg Meyer in 1983. A spectator at last year's marathon, Keflezighi told CBS News' Jeff Glor he was motivated by the tragedy that occurred then. "That night I said to myself how wonderful would it be to come back and win this for Boston," he said. At 38, he is the oldest person to win the Boston Marathon since 1931. "Most people thought my career was done," Keflezighi told Glor. "But you can't test the heart." Jeptoo clocked 2 hours, 18 minutes, 57 seconds. She becomes the seventh three-time Boston Marathon champion. Jeptoo broke away from a group of five runners at the 23-mile mark. Buzunesh Deba of Ethiopia finished second with an unofficial time of 2:19:59. Last year, the two pressure-cooker bombs that went off near the finish line killed three people and wounded more than 260 in a hellish spectacle of torn limbs, smoke and broken glass. Police were deployed in force along the route, with helicopters circling above and bomb-sniffing dogs checking through trash cans. Officers were posted on roofs. Despite heightened security, the mood was festive at the finish line on Boylston Street. Spontaneous applause broke out as a group of Boston police officers walked near the site of last year's twin bombing and children danced as the Rolling Stones' song "Start Me Up" blared over the loudspeakers. The most obvious change for the 118th edition of the world's oldest annual marathon was the heavy security presence. State and local police officers were everywhere, even on the rooftops of some buildings. Helicopters circled above and bomb-sniffing dogs checked through trash cans. Boston Police Commissioner Bill Evans -- who has himself run the Boston Marathon 18 times -- told Glor the challenges of properly policing the 26.2-mile race are considerable. "This is a soft target," Evans said. "There's eight cities and towns here that are involved." In addition to the thousands of extra uniformed officers added to the security effort, "we're going to have a lot of undercover assets working the crowd," Evans said. Runners attending the event had to use clear plastic bags for their belongings, and fans hoping to watch near the finish line were encouraged to leave strollers and backpacks behind. Police have taken a zero-tolerance policy to any potential threats this year. More than 100 cameras have been installed along the route in Boston, and 50 or so "observation points" will be set up around the finish line "to monitor the crowd," the Boston Athletic Association said. Boston Marathon race director Dave McGillivray said it had been a long and difficult year. "We're taking back our race," he said. "We're taking back the finish line." At 2:49 p.m., the time the bombs went off, spectators observed a moment of silence at the finish line. It was followed by some of the loudest cheers of the day as people whooped, clapped and rang cowbells. A total of 35,755 athletes were registered to run - the second-largest field in its history, with many coming to show support for the event and the city that was traumatized by the attack on its signature sporting event. "I can't imagine the number of emotions that are going to be there," said Katie O'Donnell, who was stopped less than a mile from the end last year. "I think I'm going to start crying at the starting line, and I'm not sure I'll stop until I cross the finish line." Boston Mayor Martin Walsh: "Boston is a safe city"
Buses bearing the message "Boston Strong" dropped off runners at the starting line in the town of Hopkinton. A banner on one building read: "You are Boston Strong. You Earned This." Among the signs lining the end of the route was one paying tribute to 8-year-old Martin Richard, the youngest of those killed in the bombing. "No more hurting people. Peace," read the sign. A photograph of Martin holding a poster he made for school with those words was published after his death. "I showed up, I'm back, and I am going to finish what I didn't finish last year," said Mary Cunningham, 50, of St. Petersburg, Fla., who was stopped a mile short of the finish line by the explosions last year. Sabrina Dello Russo, 38, of South Boston, was running her first marathon for a good friend, Roseann Sdoia, who lost her right leg in the bombing. "She is my inspiration from day one last year when I saw her in the ICU. Every run I do, she is in the back of my head, and she will be keeping me going today," Dello Russo said. Deval Patrick: 2014 Boston Marathon will be "very safe"
While Gov. Deval Patrick said there had been no specific threats against the race or the city, spectators of the world's oldest annual marathon had to go through tight checkpoints before being allowed near the starting and finish lines. "With everything that happened last year, I can't stop worrying about it happening again. I know the chances are slim to none, but I can't help having a nervous pit in my stomach," Weisberg said. Among the spectators cheering runners near the finish line was Jeff Bauman, who lost his legs in the bombing. It was the first time he had returned to the area since the attack. "It feels great" to be back, he said. "I feel very safe." Race organizers expanded the field from its recent cap of 27,000 to make room for more than 5,000 runners who were still on the course last year at the time of the explosions, for friends and relatives of the victims, and for those who made the case that they were "profoundly impacted" by the attack. Women's Elite Division winner Jeptoo said she had been hoping this year for a title she could enjoy. "It was very difficult to be happy. People were injured and children died," she had said of last year's marathon. "If I'm going to win again, I hope I can be happier and to show people, like I was supposed to last year." Other runners were expected to remain on the course for several hours after the winners crossed the finish line. Last year, the bombs went off at 2:49 p.m., as spectators crowded around the finish the line to cheer the still-arriving runners about five hours into the race. Dzhokhar Tsarnaev, 20, is awaiting trial in the April 15, 2013, attack and could get the death penalty if convicted. Prosecutors said he and his older brother - ethnic Chechens who came to the U.S. from Russia more than a decade ago - carried out the attack in retaliation for U.S. wars in Muslim lands. One runner Monday, Peter Riddle, a 45-year-old Bostonian, said he suffered post-traumatic stress disorder from being at the finish line last year. "I did a lot of talking this year, but running has helped me resolve a lot of things in my head," he said. "Running the marathon this year and running down Boylston Street will help me find peace and help me move forward."